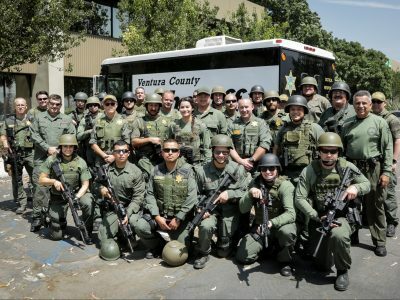 The Tactical Response Team (TRT) is a group of specially trained deputies that are utilized in a variety of law enforcement situations that exceed the capabilities of standard patrol resources. These situations include crowd management, wildfire, flood, earthquake, and sustained operations in rural areas or compromised urban environments. To meet these challenges, the members of TRT train with numerous other units including the Aviation Unit, Bomb / Arson Unit, Mounted Enforcement Unit (MEU), and the Ventura County Fire Department / Hazardous Materials Unit. Each member of TRT must be trained in numerous disciplines and be ready to deploy in any of several configurations, depending on what the circumstances require.